This is going to be a blog stats nerdery report, so you can skip it entirely if this sort of thing bores you. At the halfway point of 2017, Whatever is on track to have the lowest number of direct site visits of any year since 2008, which is the year the site started being hosted by WordPress VIP. If current visitorship levels continue, the site will end up with around 4 million visits for the year. That number is nothing to sneeze at, but it’s also considerably off the eight million visits the site got in 2012, the highest-traffic year of the site. So what’s going on this year that’s bringing the traffic down? I think there are a number of things going on. The first chunk of things has to do with me. I’ve written comparatively less here this year than in other years, and there’s a pretty direct correlation between the number of posts and the number of visits. Write fewer posts and you’ll get fewer visits. This year there are have been 230 posts to date (231 with this one); in 2012 I posted 848 posts total, which means probably twice as many posts that year at this point than this. Also this year I’ve had no post really “break out” yet — the massively-shared post that boosts readership at the site. Again, in 2012, I had a stack of those: the “Straight White Male” post, but also “A Fan Letter to Conservative Politicians,” “A Self-Made Man Looks at How He Made It” and “Who Gets to Be a Geek?” and a few others. Those are things you can’t plan for — you can try to make something viral, but there’s no guarantee it’ll work — and you just take them as they come. This year has had some widely shared posts, but nothing on that sort of scale. Finally in this category, and largely explaining the first two, this year my focus has been elsewhere a lot of the year to date. Offline, I’ve been touring and traveling heavily, primarily to promote The Collapsing Empire, and working on writing Head On and doing a few other projects. All of those leave less time for writing longer-form thoughts here. This factor also means Twitter is in many ways more congenial to my schedule — it’s easier to dip in and out of when I have a snarky thought, which as most of you know is pretty often. Plus there is some stuff that I would write here that I now write over at the Los Angeles Times, because they pay me money for that, and I like money, and also the larger audience a major newspaper provides, online and off. Basically that last point is: Hey, I got busy with paid and promotional work! Which was and is always the goal. But it also means longer posts here are often the first to get cut in the list of “things to do today.” Not always — sometimes I just have to say something — but usually. First up, the general collapse of blogs, which has been happening for a couple of years now, really seems to have accelerated in the last year. 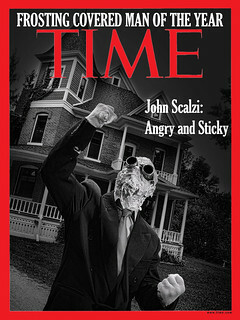 I notice this anecdotally, first in that the number of personal blogs referring visitors to the site has dropped significantly, and secondly in that when I do the occasional Google search on “Scalzi,” filtering for the last 24 hours of references, very very few blogs show up anymore; its mostly book reviews and sites masquerading as pirate media servers in order to give the unwary a virus. Now, if I’m writing fewer posts (and fewer long-term posts), there’ll be a drop because of that anyway, but I have a more stable metric for this stuff as well: The Big Idea posts, which I post regularly even when I don’t otherwise post, and which have stable (and nice!) visitor stats. Two years ago, a good number of personal blogs would link into Whatever to note Big Idea posts; this year, again, very few. Basically Twitter and Facebook have largely completed their digestion of the blogosphere at this point. This is also reflected in my stats: The two largest referrers to the site are these two. But there’s no way to parse out in my site stats where on either site the links originate. From a site stats point of view, they’re both black boxes. So basically fewer people are getting to Whatever through the ways they used to. But — and here’s an salient point — I don’t think the content of the site is overall getting fewer readers, because there are other ways they read it now without directly visiting the site. For example, Whatever has (as of this very moment) 28,342 people who follow the site via WordPress, which means they see the posts not on the site, but through an RSS-like feed which they can scroll through. Whatever has another 12K or so subscribers via Feedly last I checked, and a couple thousand at least who get posts emailed to them. So that’s 40K+ people who get whatever I write here without ever having to come to the site unless they want to comment. Then there’s stuff like Google’s AMP initiative, which, if you click a Whatever result on Google while you’re on a mobile device, presents you with an alternate “streamlined” mobile-friendly version of the post rather than taking you directly to the site (which, I will note, already presents a mobile-friendly version of the site). Those readers aren’t captured on my site stats either, as far as I can tell. What this means, basically, is that for 2017, there’s something like 9+ million potential visits to writing on Whatever that aren’t being registered in the site stats (I say “potential” since not every post sent out via WordPress or Feedly is going to be read by an individual subscriber). Which is significant! And also suggests, again, that the issue is not fewer people having access to the writing on Whatever, but me not having access to the full numbers (or, more accurately, meaningful numbers). This is another example of how the Web has changed substantially, even in just a few years. What does this mean for Whatever? Honestly, not too much. I don’t rely on Whatever for income, so the visitor stats, while they’re interesting for me (I mean, obviously), don’t have on effect on how I run the site. I don’t have to post clickbait-y pieces to drive traffic, and depending on my whim, I can post six pieces a day or none. Once again, “Whatever” exactly describes what the site is about; it’s whatever I have on my mind, how I wish to present it, when I have the time to do so. On a personal level, I admit that this diffusion of Whatever readership is annoying to me; I liked it better when I had a better idea just how many people were reading my stuff at any one time, rather than having to guess. I’m kind of a stats nerd, it seems. I suppose if I wanted to splash out a lot of money and time I could probably find a stats program out there that could interface with everything and give me a more accurate picture, but: Money and time. I don’t really want to spend either. And anyway, as much as I enjoy Twitter and other social media, sometimes I just want to write at length, and this is the place for that. The occasional tweetstorm (i.e., chaining multiple tweets on a subject together) is fine, but honestly if you’re going to write at length, just write a friggin’ blog post and link people into it. Also, and again, I own this site. Long after Twitter or Facebook is a memory, as long as I pay for this site, it’s here to stay. So: However you’re reading this, thanks. I’m glad you are. Let’s keep going through 2017. 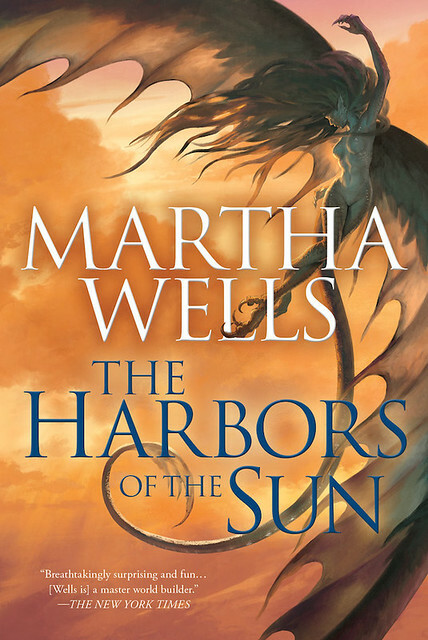 All good things come to an end, and for The Harbors of the Sun, the last book in Martha Wells’ Raksura series, the author takes a look at how she got here, and what the series, and the journey of writing it, has meant to her. After four novels, and two novella collections, The Harbors of the Sun is the last book in the Books of the Raksura series. It’s fitting that The Harbors of the Sun is about the end of a journey, because it’s been a long road to its publication. The first book in the series, The Cloud Roads, came out in 2011, after taking two years to find a publisher. It was the book of my heart, a book that in many ways I had always wanted to write. 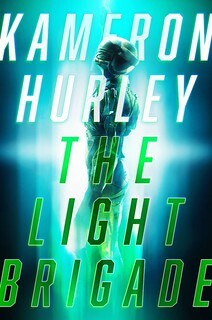 But at first, nobody seemed to want to publish a book with no humans in it, where the main characters were matriarchal bisexual polyamorous flying shapeshifting lizard-lion-bee people. Go figure! I always felt that despite having non-human protagonists, the themes of the series were universal. Like finding a family and a home and protecting it against outside attack and environmental pressure. Learning to trust when suspicion, paranoia, and pretending to be anything other than what you are have been your main survival traits. Learning to fit into a complex society and web of relationships that seem almost impossible to understand. How hard it is to leave your past behind. Plus there’s a lot of adventures and exploration and flying and people-eating monsters; who wouldn’t want to read about that? I put a lot of my own feelings of isolation into the story. I’d been a weird, lonely kid who grew up as an SF/F fan at a time when nobody else I knew liked or cared about it. I also wanted to capture that sense of wonder and possibility, of strange worlds with no boundaries, that I felt while looking at old books with pulp covers in the SF/F corner of the public library. (The corner that I was too young to look at yet but it was their own fault for putting the children’s section next to it.) After years of trying, I felt like I had captured that feeling with the Raksura. Then finally, despite everything stacked against it, The Cloud Roads was published, and then The Serpent Sea, The Siren Depths, and the two novella collections. And even though I had gotten the Indigo Cloud Court settled in the Reaches and (mostly) happy, I still wanted to explore more of the Three Worlds with these characters. I wanted Moon and Jade and the others to go on an adventure outside the relative safety of the colony trees, and to explore the conflict between the Raksura and the predatory Fell. In many ways, the Raksura didn’t know very much about their world. I wanted to take the characters and the reader on a journey to find out more. I wanted to push the boundaries as far as I could. And that idea became The Edge of Worlds and The Harbors of the Sun. So, it’s been a long journey to get to The Harbors of the Sun, the end of the story of Moon, Jade, and the Indigo Cloud Court. This is the most I’ve ever written in one world, and it’s bittersweet to say goodbye to these characters. These are still the books of my heart, and the books I always wanted to write, ever since I was that little kid in the public library.